Can A-PDF Track FlipBook by Google Analytics? I am a free writer, I live on my writings, in the past years I published some articles online, but I always wonder how many readers are there! I know the Google Analytics is a tool of Google which will help users online to know the viewed data, so I wonder if I have an online flipping book, how the Google Analytics can be embedded? In A-PDF, there are lots of software for different original files to be converted into online flipping page book. The A-PDF FlipBook Maker is the easiest for it has no page edition effect, but this software still supports Google Analytics ID embedding. 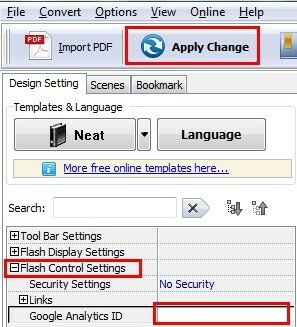 The key step: you can add your Google Analytics number in Flash Control Setting as the screenshot! Apply Changes to save and apply your Google Analytics ID to the flipping book. In order to get the viewing data from Google Analytics, you should upload the flipping book to your own website or so you can upload to A-PDF server directly but not the publish to local. You can search for upload FAQ later.